At €8500/US$8000/£8000, the DMP-Z1 is easily Sony’s most expensive Walkman to date. The press release tells us that it is a battery powered device. From the accompanying press shots scream a large gold volume knob with neighbouring 4.4mm balanced and 3.5mm unbalanced headphone outputs. However, only on the ground in Berlin at IFA 2018 do we get to see just how big and heavy the DMP-Z1 actually is. Sat in a glass case, the new Walkman fails to be dwarfed by Sony’s TA-ZH1ES desktop headphone amplifier and apparently tips the scales at a whopping 2.5kg (5.5lbs)! The new flagship Walkman’s weight and size might push the definition of portable to breaking point but Sony provides a stylish carry-case nonetheless. 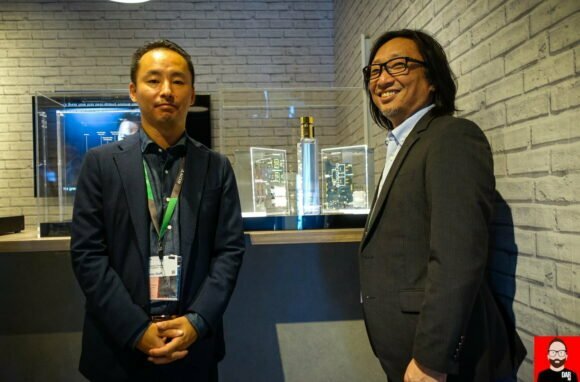 Also present at IFA 2018 were Sony Walkman development engineers Mitsunori Tanaka and Hiroaki Sato who helped flesh out the DMP-Z1 story with details less obvious. Despite its carry case, chassis bumpers and battery power, the DMP-Z1 is a Walkman intended primarily for home/office use with a broader range of power-hungry headphones than its predecessor: the DMP-Z1’s balanced socket gives us 1.5 Watts into 16 Ohms and the 3.5mm 570mW into 16 Ohms. 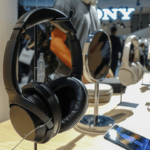 We might, therefore, see the new model as a (transportable) headphone amplifier with three digital inputs: the 3.1″ touchscreen Walkman cradled in its belly; its aptX Bluetooth receiver; and the rear-facing USB-C socket. Support for double-rate DSD, PCM up to 32bit/384kHz and MQA all feature here. 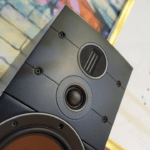 The volume knob operates in the analogue domain and is made from gold-plated aluminium. So too are the plates that sit directly beneath the DMP-Z1’s glass-finished top and bottom. Tanaka-San says aluminium was chosen for its superior sound quality over other materials. Battery power has been implemented to keep the Walkman’s sensitive internal circuits away from noisy mains power. Seen as an exploded view in another glass case, we note the internals’ H-shaped chassis – also aluminium – that keeps digital and analogue sections separate to minimise electrical noise pollution between the two. The digital Walkman board and its twin AKM AK4497EQ DAC chips are powered by a single battery. For the analogue board, two batteries power the upper half of the music signal and two handle the lower half. All internal wiring comes from Ray Kimber. According to Tanaka-San, the DMP-Z1 offers 9 hours of hi-res audio playback and 10 hours of MP3…but with the Walkman screen switched off. We can also listen whilst the unit charges and with enough fuel in the tank, the mains supply can be disengaged from the audio circuits even with charging cable still connected. The new Walkman has 256Gb of internal storage to which we can drag and drop files from a USB-connected computer. Alternatively, behind a flap on the left cheek sit a pair of microSD card slots. There’s no denying that the DMP-Z1 is expensive but calls of “rip-off” are nothing but lazy, knee-jerk reactions to the price tag and the price tag alone. Functionality and performance must also be factored in. Does it sound better or worse than similarly priced competitors? Does daily use expose any foibles? How smooth or glitchy is the software? What does the extra dollop of output power mean for high-end headphones?